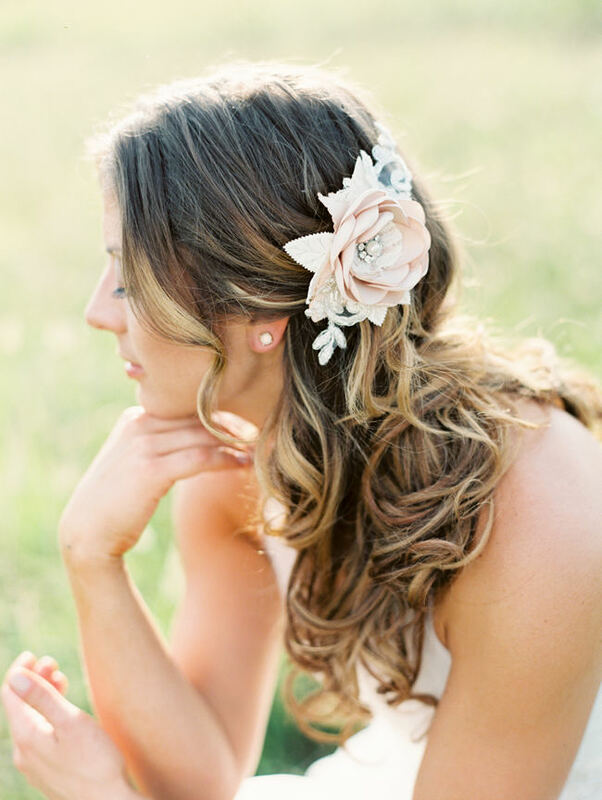 How to choose the perfect bridal hairpiece for your wedding! 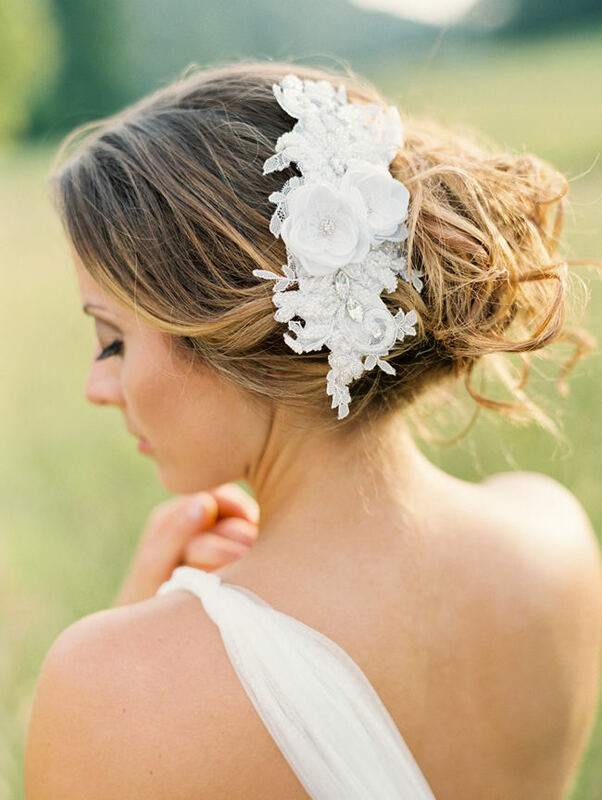 Today’s expert styling advice on how to Choose The Perfect Bridal Hairpiece comes from Romantic Art Life, the designer of these gorgeous handmade and oh-so-dreamy bridal accessories. In addition to learning how to select a bridal hairpiece, we share Romantic Art Life’s collection delicate and oh so romantic pieces. Inspired by her love of nature, the collection reflects gentle beauty of flowers, and Anastasiya’s passion for feminine beauty. 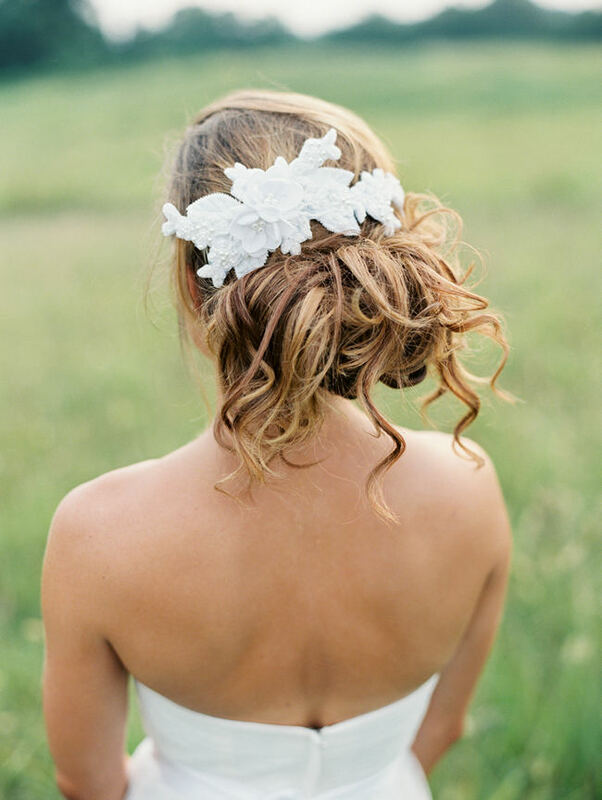 We asked Anastasiya for some expert advice on how to choose the perfect bridal hairpiece. She gave us so many great tips about dress, hairstyle and colour considerations which we’ll be sharing along with her fabulous collection. When choosing the perfect bridal hairpiece it is not essential for your hair piece or your dress sash to match your dress perfectly but it should look balanced and work in harmony with the details and accents on your gown which makes it important to have the final gown in mind beforehand. Your personal style will determine your overall look and feel therefore it’s very important that it reflect who you and your fiancé are. 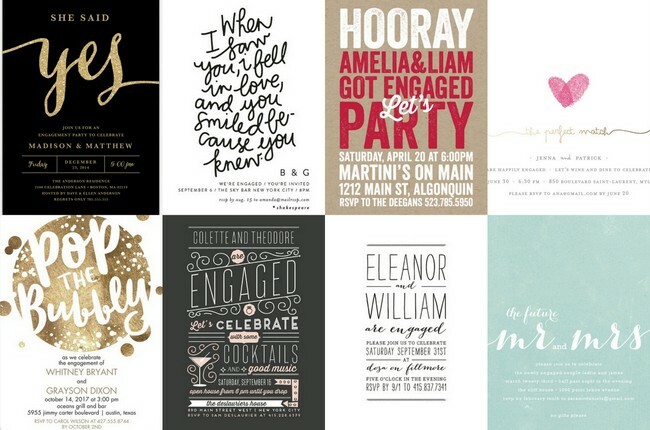 It can be romantic, elegant, classic, vintage, rustic or modern – anything really! 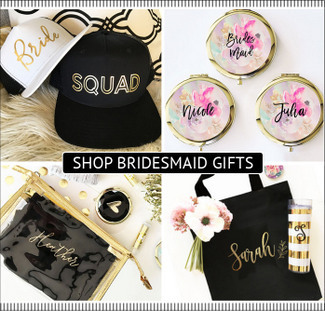 Considering your wedding style beforehand will also help you to decide on an appropriately styled venue, decor, and, of course, your bridal accessories. 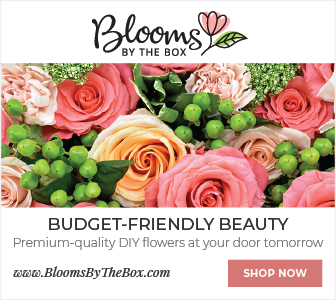 Romantic Bridal Accessories: If you are a romantic bride who loves blooms, a delicate flower clip or small flower pins will add a perfect touch of elegance to your soft look. Fashionista Bridal Accessories: A sparkling headband styled along the hairline is the perfect alternative piece for the modern bride. 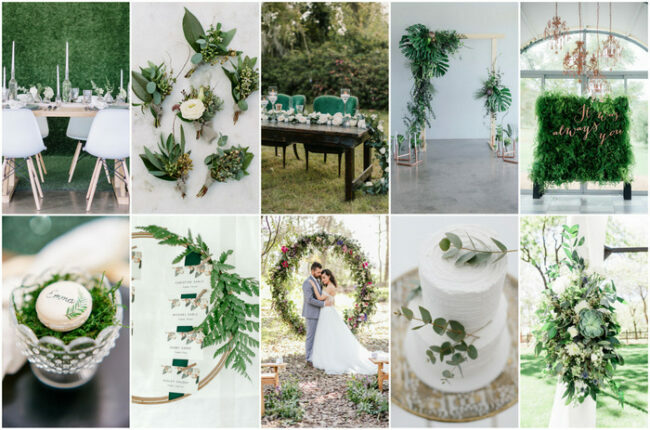 Bohemian Bridal Accessories: For a bohemian bride, or a one who dreams about beach wedding, a flower crown style headband with flower one side, or a beaded lace headpiece, will be the perfect finishing touch. 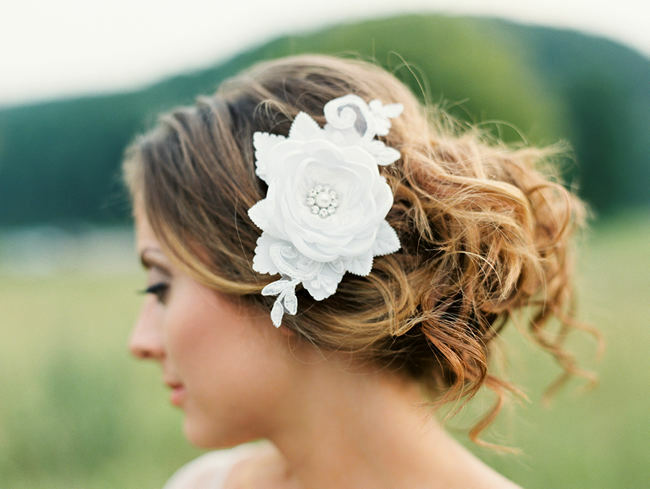 Vintage Bridal Accessories: For those who love vintage styling, a hair comb is a fabulous option. 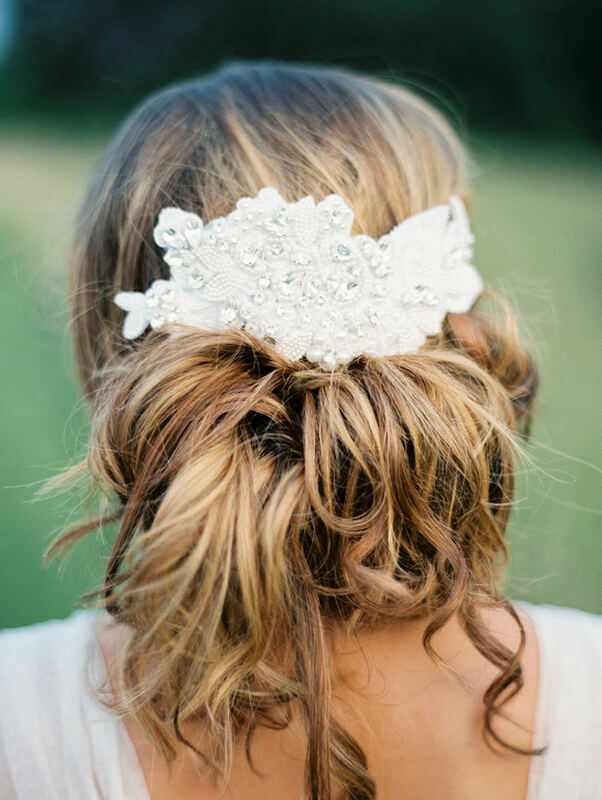 A comb is very versatile and can be decorated with flowers, lace & leaves, or even styled as a sparkling lace piece with beading and crystals for an extra glamorous look. 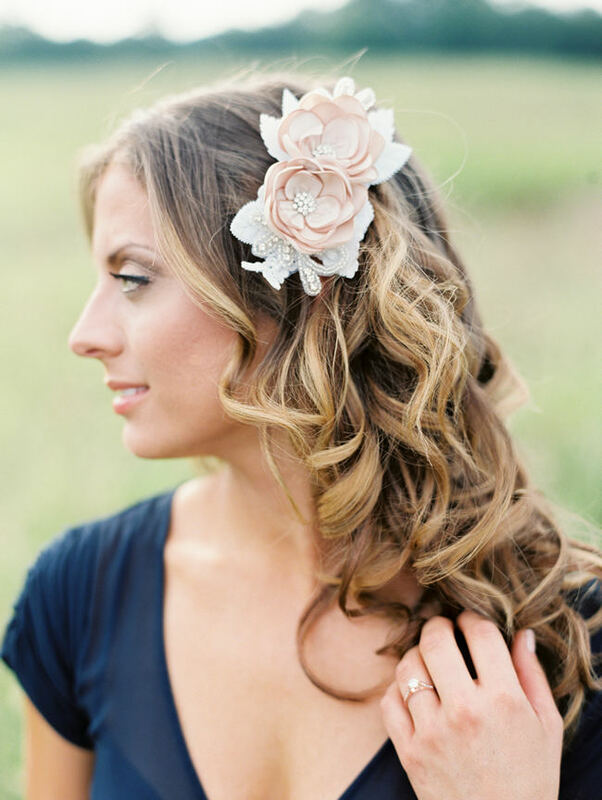 Traditional Bridal Accessories: If your style tends toward the classic, you may like to have a tiara or crown accessory. 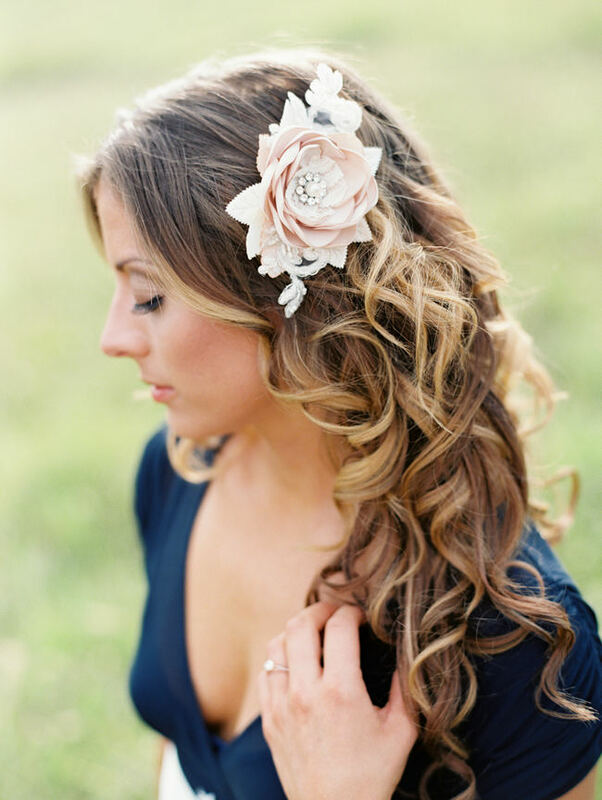 You can wear these alone or with a veil, and it will also work beautifully with both up-dos and long, loose curls. 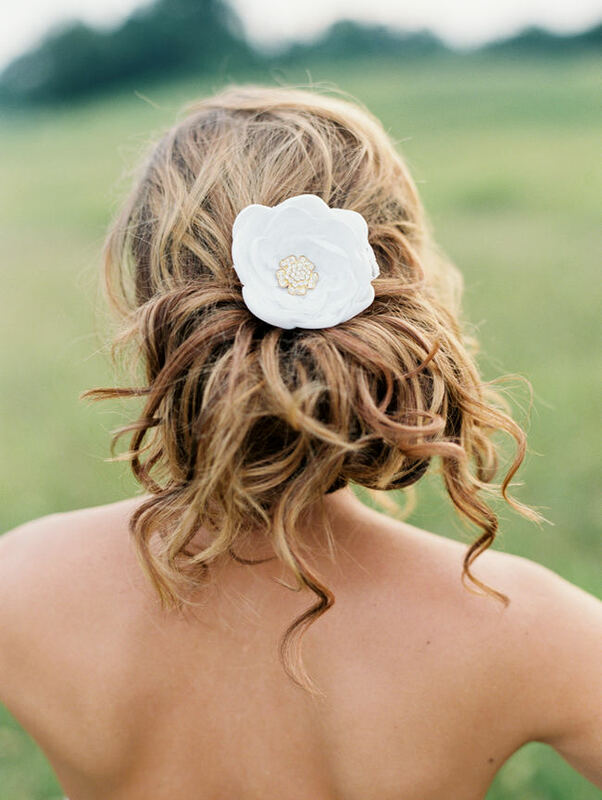 Soft and delicate accessories may be perfect for fine hair, but won’t be as noticeable with thick waves. If you are lucky and mother nature gave you thick, strong hair, you may need a bigger piece to make the right statement. 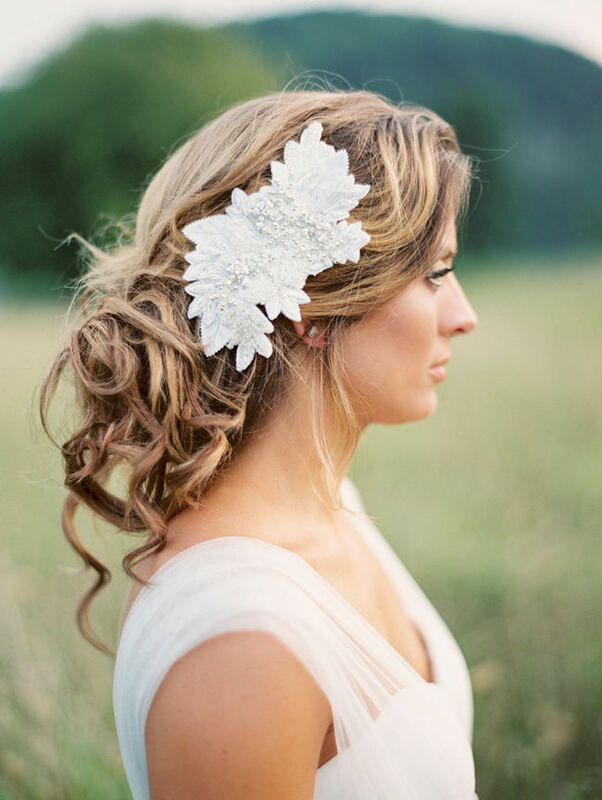 When it comes to styling your wedding look your bridal accessories can help you feel so much more like yourself. But choosing the right piece can be challenging sometimes. It is very helpful if you schedule an appointment with your hairstylist to talk about the type of headpiece that will look the best with your hair, head size, and face shape. 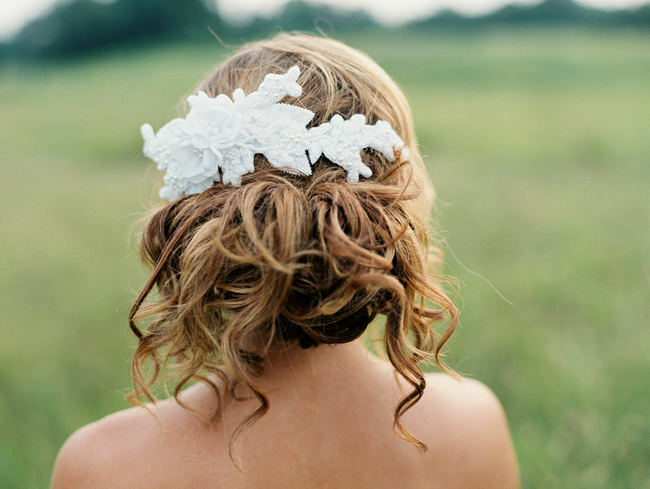 A bridal headband can look completely different on if you place it flat against your head or lift it up at the crown. The higher you place your accessory, the more dramatic the look. Apply it closer to the face if you want your piece to stand out more. 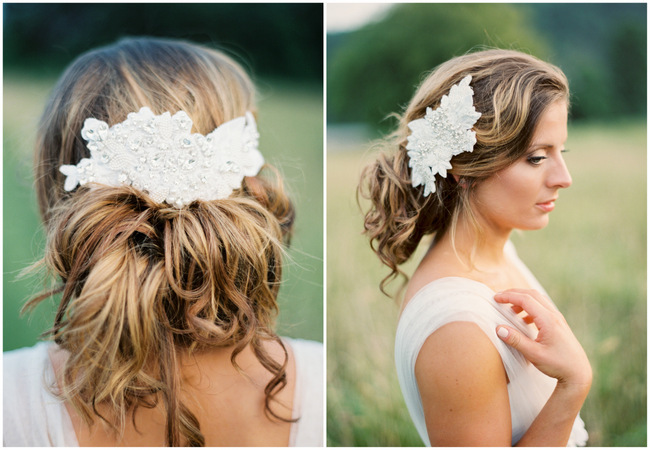 A hair comb can look very pretty if you wear it one a side or can add a special touch above the bun from behind. 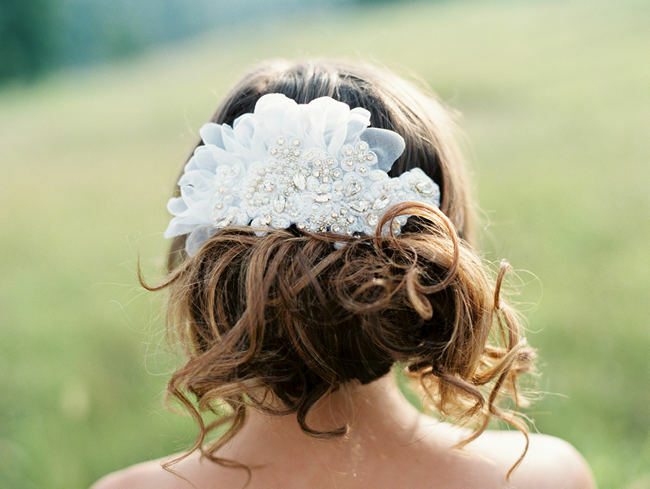 Many bridal accessories perfectly adorn a range of bridal hairstyles but make sure whatever you pick feels secure while you’re moving around. 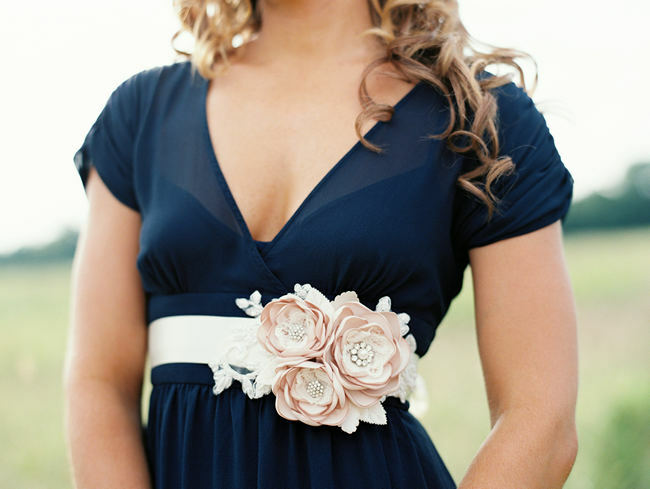 Though having your accessories match the exact color of your dress is good, it is not essential. However, you should keep in mind that there are many different variations of white and ivory, some working better together than others. Ivory is beautiful when paired with gold since it highlights the creamy tint of the fabric. For a pure white dress, add some silver beading or pearl detailing – gold may clash with brighter white hues. Soft, off-white colors look amazing with yellow gold, rose gold, silver or pearls. If the dress is already embellished with beadwork, let that dictate the colors and detailing of your accessories. 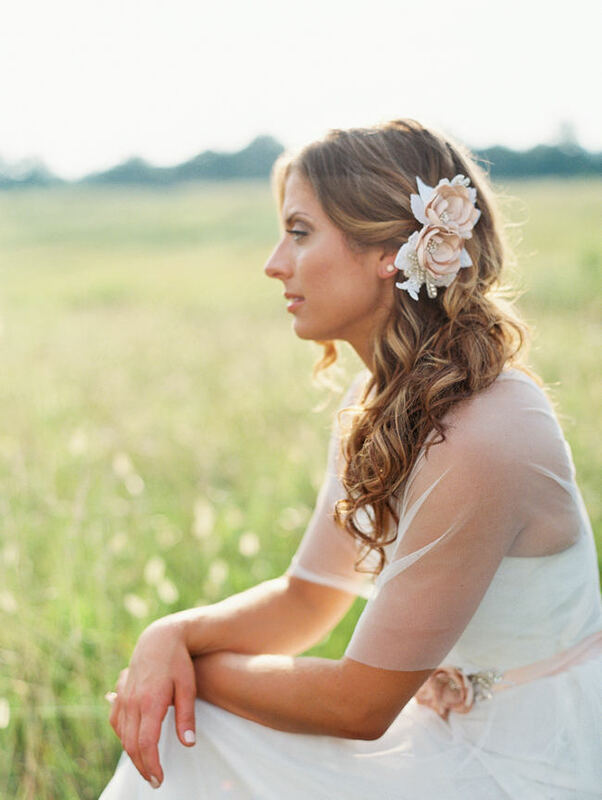 Soft blush tones or champagne hues look gorgeous with ivory. Delicate silver or gray shades will look beautifully with white or off-white gown. 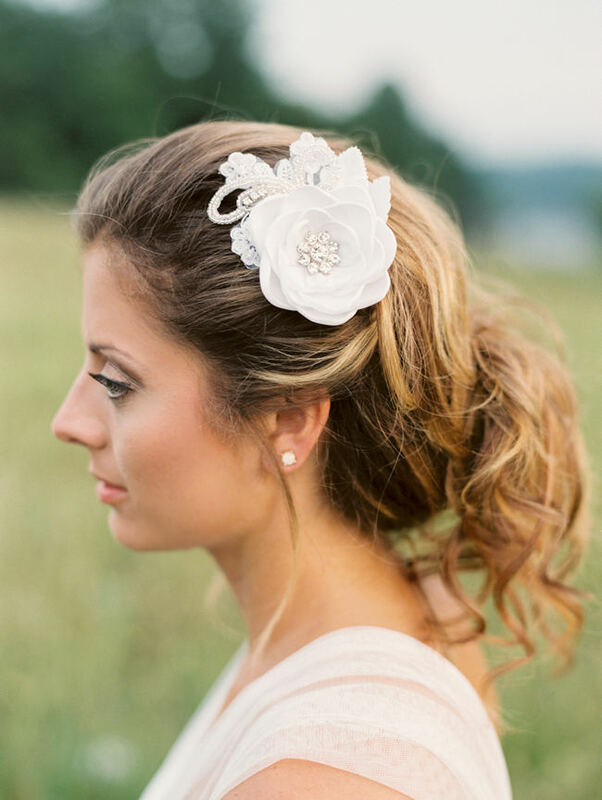 All of your accessories should work together in total harmony when figuring out how to choose the perfect bridal hairpiece. 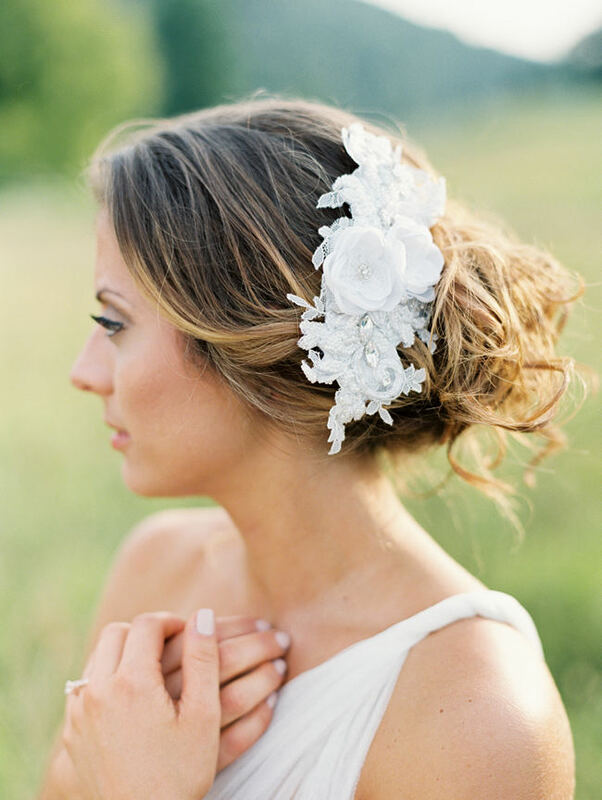 Your jewelry, headpiece and bridal sash should enhance your look, not distract from it. You don’t need to have everything look so eye catchingly gorgeous that they all compete for attention. 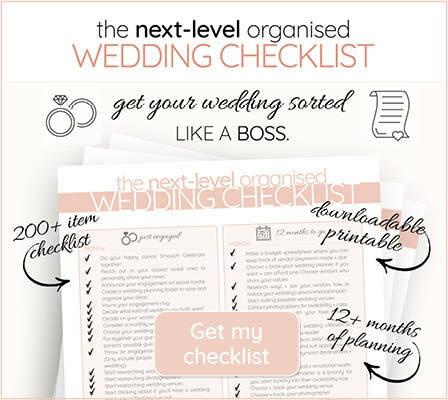 Accessories are just a unique touch to your look, but too many can take away from your stunning gown. Remember, less is more! When a designer such as myself hand makes each piece to order, the options are endless. As a designer, I want to make sure my brides are happy with their accessories and that they receive pieces which complement their gowns, which suit their personalities and work with their hairstyles. When deciding on your final piece, it is always good to see fabric samples first. And never be afraid to ask a question about any item – a good designer of bespoke items is always happy to help! Every handmade accessory takes time make and forms part of a long creative process. To avoid any stress make sure to order your pieces well in advance. Ideally you need your headpiece and accessories to be ready in time for your hair trials and final dress fittings. It is so nice to try everything on together before the big day! 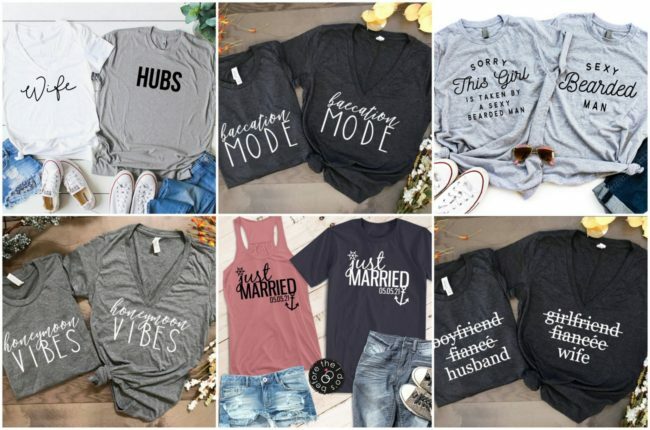 I recommend placing your order at least four months before your wedding date. 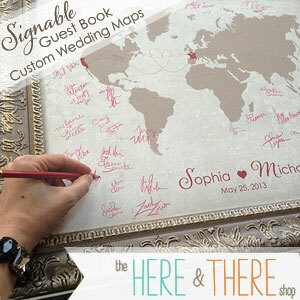 If you are planning to have a custom made piece then start discussing all the details 5 month before your wedding. 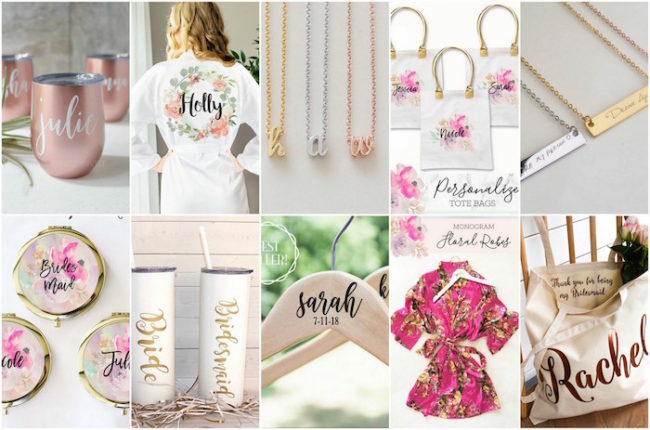 If you feel like your wedding gown needs something extra to personalize your wedding look, than adding a bridal sash will be a right choice for you. 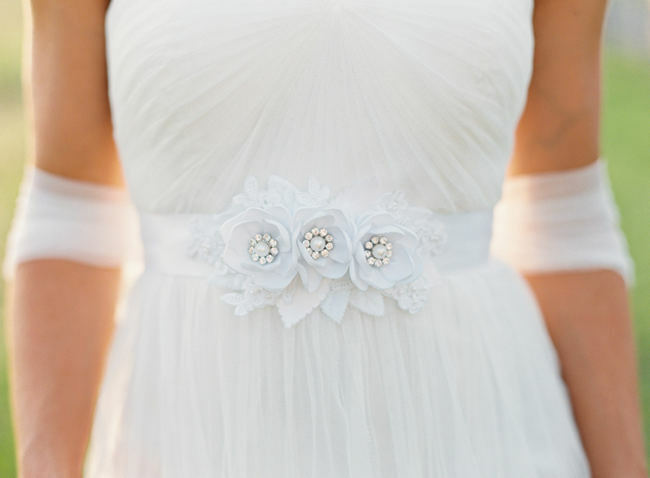 A wedding dress sash will add a unique delicate touch and help to show off your feminine side. Just remember to pair it with your other accessories. 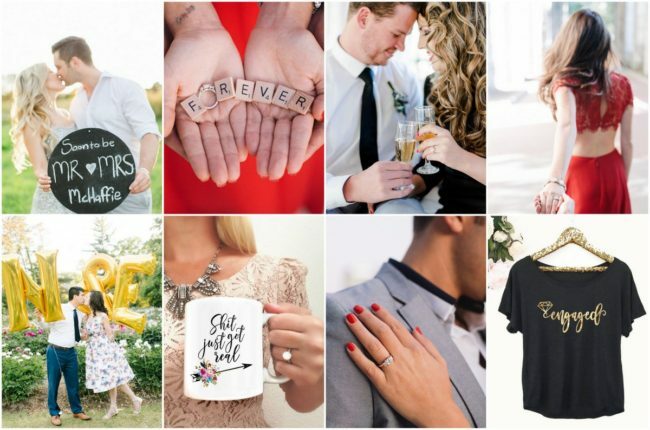 Many brides have dreamed of their wedding day since girlhood and probably have a very specific picture in mind. 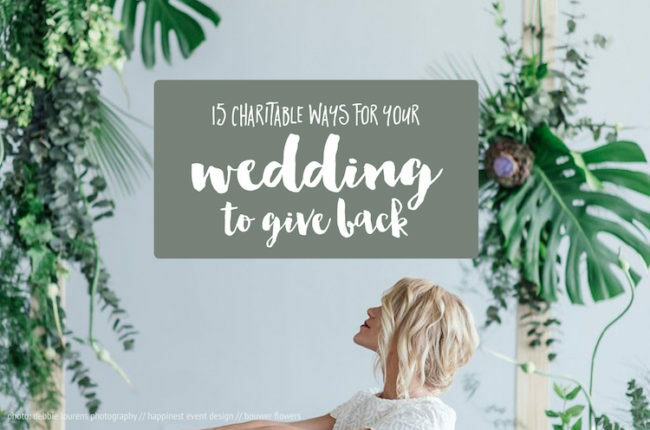 Despite this, it’s a great idea to start looking for inspiration based on current wedding trends and ideas before you begin planning. You might fall in love with something beautiful which you had never imagined or seen before. 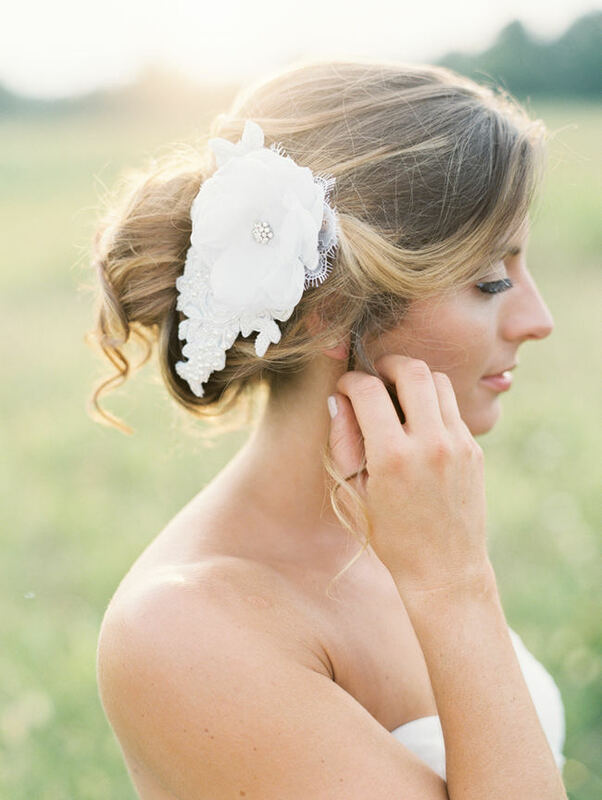 Make sure you do lots of research when deciding how to choose the perfect bridal hairpiece. 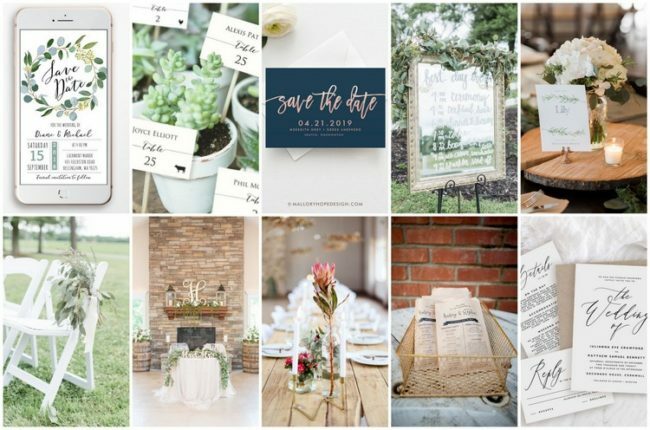 There are so many beautiful wedding blogs have lots of gorgeous ideas. 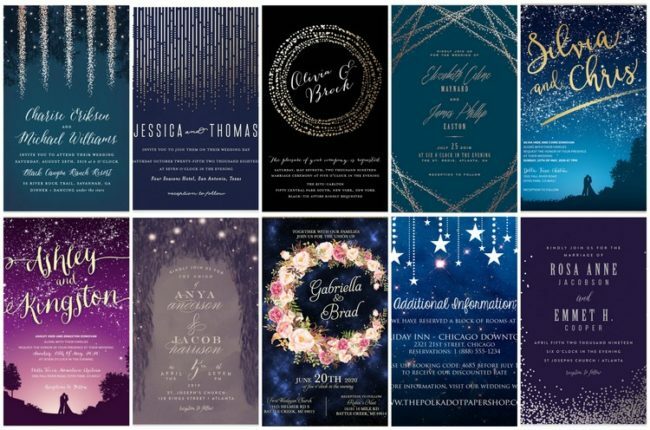 You can also search Pinterest too – one of my favorite places to find breathtaking ideas. 8. HAVE FUN! Don’t forget to have fun! This is your most memorable & happy life event, so enjoy every part of it! 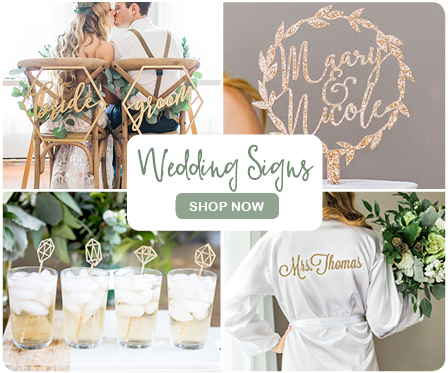 Make sure you visit the Romantic Art Life line on Etsy here to swoon over each and every delicate design!